Sunburn occurs when the skin is burned by overexposure to ultraviolet (UV) rays of the sun. It often presents as red, sensitive, and painful skin, and can result in damage and diseases. Sunburn can happen at any time of the year because UV rays are almost always present. Unfortunately, there is no cure for sunburn; the inflammation and redness cannot be removed by taking a single pill or treatment. However, sunburn is serious and should be treated effectively. Sunburn treatment can take many forms. Severe sunburn may necessitate medical assistance, but in most cases, sunburn remedies are sufficient and effective. While this condition typically goes away naturally and passes within 7 days, there are natural sunburn home remedies that can help reduce sunburn symptoms quickly. The best thing to do when it comes to sunburn is to prevent it. If you are already experiencing this condition, however, there are tips and remedies for sunburn that are both fast and effective. Potatoes can help to resolve pain and redness associated with sunburn. Potatoes are widely known for their pain relief power, especially when it comes to minor scratches, bites, irritations and burns. Thus, this remedy is considered to be one of the best and easiest for soothing painful, sunburned skin. Which part of the potato is best? There really is no right answer. Some people consider the potato juice to be the best, while others find the slices most soothing. Try them both and see which works best for you. Cool milk is another great, at-home remedy for sunburn. Placing a compress of cool milk on the skin is simple and cost effective. The coolness can ease the pain while the milk works to create a protein layer that helps to protect the skin. Baking soda can also offer quick sunburn relief. Another similar alternative is cornstarch. Mix it with water to form a paste and apply to the skin or dissolve it in bath water to soak. There are many serious consequences of sunburn, one of which is dehydration. It is crucial to hydrate after being exposed to the sun for too long. Increasing water consumption can help heal your damaged, burned skin while also ensuring proper hydration. Mint is known for its natural cooling effect and tea for its natural healing power. For an easy and extremely effective natural sunburn remedy, simply boil fresh mint leaves with green tea. When the mixture chills, use cotton pads to apply the liquid to your burns. The theobromine and tannic acid in the green tea, along with the mint, will help to relieve the pain and heal your skin. Aloe Vera is a well known sunburn remedy commonly used to relieve pain and inflammation. Aloe Vera is cooling and soothing when placed on the skin. As an added bonus, Aloe Vera is also useful for many other ailments, so it’s always beneficial to have on hand! Aloe Vera can be purchased at a local drug store or supermarket, or you can grow Aloe Vera right in your home. Growing your own Aloe Vera ensures that it is free from additives and the plants are quite easy to maintain. Lightly applying apple cider vinegar on sunburn is something people have done for hundreds of years. While research supporting the effectiveness of this remedy has not been published as of yet, many people swear by it and its ability to help resolve sunburn. Witch hazel is known for its ability to heal many maladies and ailments. The leaves, bark, and twigs are often used for medical purposes, and contain chemicals that reduce swelling, ward off bad bacteria, and repair damaged skin. Witch hazel can be found in a distilled liquid, known as witch hazel water, that is easy to apply to the skin. Yogurt contains many probiotics and enzymes that work well to protect and heal the skin. If you are sunburned and in need of a simple home remedy, something as simple as the yogurt in your fridge can help you get some relief. Just make sure it is plain and always avoid flavored yogurt. Taking a bubble bath may sound like a good idea, but you should always avoid suds when sunburned. The soap can irritate and dry out damaged skin. If you desperately want to soak, do it in a tepid or cool bath. Afterwards, pat yourself gently without rubbing your skin with a towel. Make sure the towel is soft. If your skin feels dry or tight afterwards, use moisturizer or Aloe Vera gel. There are many creams, pills and antibiotics that can make the skin more sensitive to the sun. Check with your doctor or read the details on all medications you are taking. Your skin may be more sensitive to the sun if you take thiazides, tetracyclines, sulfonamides, oral contraceptives, phenothizines, diuretics, diabetes medications, to name a few. If you are taking medications that make you more sensitive to the sun, make sure to take extra measures for protection, such as extra clothing and sun cream. If your skin gets easily sunburned, you should use sunscreen with maximum SPF. The sunscreen should be applied at least 30 minutes before going out in the sun, even before you are exiting your home. When applying, make sure to cover areas that are sensitive and likely to be overexposed to the sun, such as the ears, back of the legs and arms, and neck and shoulders. If you are swimming or sweating, make sure to reapply sunscreen often. Even if you’re not exposed to water, the effectiveness of sunscreen decreases over time, so don’t forget to reapply if in the sun for an extended period of time. Perhaps it is impossible to stay home during the critical sun hours, but if you decide to get out between 11.00 am and 4.00 pm, make sure you protect yourself from the sun. The sun is most powerful and damaging to your skin during this time. Therefore, you should always be mindful of the time and take precautions if needed. Cucumber is another great remedy for sunburn that works by affording a cooling and healing effect. The cool temperature of the cucumber is soothing and helps relieve pain. Furthermore, cucumber has antioxidant and analgesic properties, which also relieve discomfort by promoting the healing process. There are many ways to apply cucumber to the skin and any way you choose will result in diminished swelling, pain, and redness. Use apple cider vinegar. Adding apple cider vinegar to bath water can help to balance the pH of the skin and promote the healing process. Soak in oatmeal. Oatmeal can help soothe itchy, sunburned skin. Adding it to bath water is the best way to take advantage of its soothing properties. Use chamomile or lavender oil. These are known to relieve pain and stinging symptoms. Add to your bath water or apply small amounts directly to the skin. Add baking soda to bath water. Dissolve baking soda in the water to help ease skin redness and irritation. Avoid perfumes and harsh soaps. These dry out skin and can be harmful to your sunburn. Apply Burrow’s solution. A cool compress that contains Burrow’s solution can comfort the skin and soothe the sunburn. 1% hydrocortisone cream can be purchased over-the-counter. This is a topical cream that helps to relieve pain, swelling, and itching. Vitamin E is a good remedy for sunburn because of its antioxidant properties. It is known to decrease the inflammation caused by sunburn, and its properties can speed up the healing and renewing process. You can apply Vitamin E oil directly to the skin or take a Vitamin E supplement. Teabags can help you get rid of the burning sensation in your eyes that occurs when your eyelids are burned by the sun. Natural ingredients in the tea also help reduce inflammation. Soak them in cold water prior to applying them onto the eyes for a cooling effect. When the lips are sunburned, they may start peeling and become painful. If this occurs, apply Aquaphor ointment or petroleum jelly to keep them moisturized and reduce the sunburn symptoms. Some essential oils, including lavender, can be applied in small amounts in order to help with sunburn. If you are looking for a natural remedy for sunburn, lavender is a good choice. Being sunburned often causes you to feel excessively warm or hot due to increased body temperature. Therefore, it is always good to keep your home cool. Turn up your air conditioner or use fans to help you blow some cool air on the burned skin. If the skin is already sunburned, this may lead to peeling. However, do not continue to peel the skin further. This can only worsen the sunburn symptoms. Severe sunburn causes blisters to appear on the skin. If this should happen, always cover them up to prevent them from tearing. Blisters should be left alone until they heal. Coconut oil can be the perfect natural remedy for sunburn, especially after the initial sunburn calms down. Coconut oil is a great moisturizer that can help to re-hydrate your dry skin. Some people think that coconut oil has UV protection properties. Unfortunately, coconut oil will not provide you with any kind of sun protection, so maintain your habit of using sunscreen when exposed to the sun. If your skin is burned from the sun, you should go inside or stay in the shade. Exposure to sun may worsen the sunburn. Also, make sure that you avoid reflective surfaces such as water. Even if you are shaded from the sun, the water can reflect the sun onto your skin and you will be exposed to sun rays. Being overexposed to the sun causes sunburn, especially if not properly clothed. You should always wear protective clothes and sunglasses when you are exposed to the sun, especially during dangerous periods of the day or for an extended period of time. The fact is, most people have experienced sunburn at least once. Sunburn is painful, irritating, and can lead to damage and disease. However, there are many home remedies for sunburn that do not require special creams or medications. 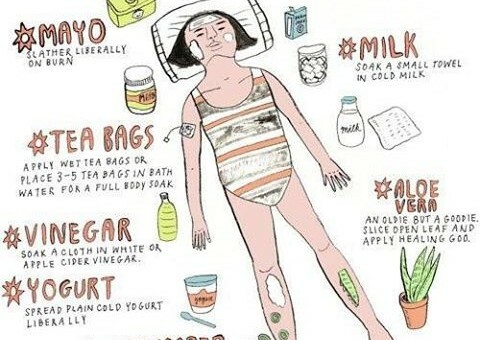 These home remedies can be used for minor sunburns and are usually very inexpensive. The best thing to do when it comes to sunburn is to protect yourself from it. Never forget to use sun cream to avoid sunburns. If you still happen to acquire sunburn, make sure you have a list of the best possible remedies to help you soothe the burning and speed up the healing process. After all, sunburns go away on their own, but why not do your best to relieve some of the symptoms naturally?